HANOI, Vietnam — Vietnam's ruling Communist Party has nominated its general secretary for the additional post of president, succeeding President Tran Dai Quang, who died last month, and ending a decades-long policy of separating top leadership positions. 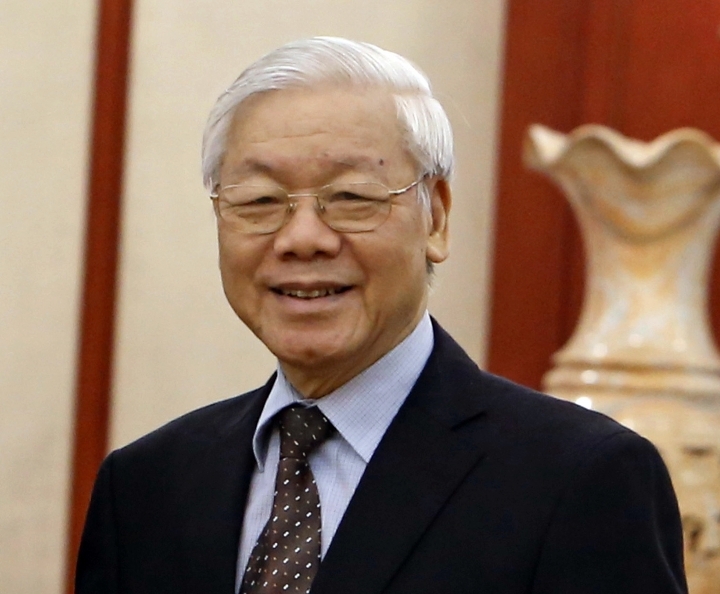 The government said in a statement that members of the Party Central Committee unanimously agreed to nominate "comrade Nguyen Phu Trong" for the position. "The question here is there needs to be a mechanism to supervise power to avoid the abuse of power if the power is concentrated too much in an individual," he said Thursday. Doanh said it's unclear whether the country's next leader will also hold both positions, and the party would decide based on the particular candidate. Speaking at a regular briefing, Foreign Ministry spokeswoman Le Thi Thu Hang said the move was made "in accordance with the constitution and meets the aspirations of voters and people." The move is unlikely to change the country's course, according to Le Hong Hiep, a fellow at the ISEAS-Yusof Ishak Institute in Singapore. "The merger is unlikely to generate any economic implications for Vietnam and its business environment as the country's economic policies will remain unchanged," he wrote in an institute publication on Thursday. "In political terms, however, the concentrated power structure will make the Vietnamese political system more unitary and less pluralistic. While such a power structure may be more efficient under certain circumstances, it will also generate certain risks as the whole political system will now depend on its ability to choose the right leader as well as to check his power." The country has seen an increased crackdown on dissidents and on corruption, with scores of high-ranking officials and executives jailed since 2016 under Trong's watch. "Fighting corruption is a difficult, complicated and long-term job," Trong told a recent anti-corruption conference. "Corruption will surely be prevented and pushed back step by step, contributing to making our party and state increasingly strong and transparent, and meeting the requirements of the revolutionary cause and the people's aspirations."